With concerns about increasing lack of access to higher education for California students, the state Senate approved a measure that would allow community colleges to offer four-year degrees. California would join 21 other states that allow four-year degrees from community colleges. Fifteen colleges would be authorized to award the degrees. UC is expecting a record number of out-of-state students this fall. While this will bring a "windfall" for the UC system – non-resident students pay an average of $23,000 over California students, or a total of $400 million extra systemwide – state senators "criticized UC for its growing recruitment efforts outside California" during a reconfirmation hearing for four UC regents and Los Angeles Times readers expressed concern that "California residents are being pushed out." 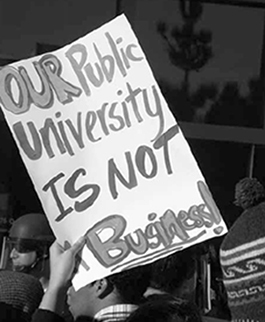 During the hearing to confirm the four UC regents, UCLA’s Daily Bruin and UCB’s Daily Californian report that students and faculty members objected to what they say was Governor Jerry Brown’s lack of consultation over the appointments, as well as the fact that all four are businesspeople rather than community, labor or academic leaders. The UC Council of Faculty Associations had asked the Senate Committee charged with confirming the appointees to reject them. Three of the four were donors to Brown’s campaign, the Daily Bruin reports. Four UC campuses are topping the Washington Monthly’s annual list of “socially conscious” campuses nationwide: San Diego, Riverside, Berkeley and Los Angeles. The list emphasizes enrolling and graduating low-income students and supporting research and public service. UC San Diego has topped the list for the fifth year in a row.